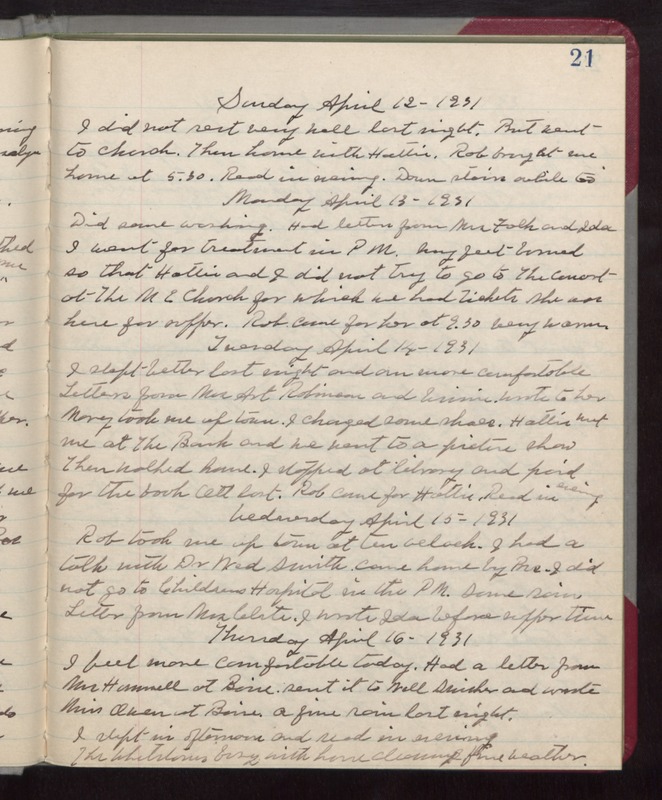 Sunday April 12- 1931 I did not rest very well last night, But went to church. Then home with Hattie. Rob brought me home at 5.30. Read in evening. Down stairs awhile too Monday April 13- 1931 Did some washing. Had letters from Mrs Falk and Ida I went for treatment in PM. My feet burned so that Hattie and I did not try to go to The concert at The ME Church for which we had tickets She was here for supper. Rob came for her at 9.30 Very warm. Tuesday April 14- 1931 I slept better last night and am more comfortable Letters from Mrs Art Robinson and Winnie. Wrote to her Mary took me up town. I changed some shoes. Hattie met me at The Bank and we went to a picture show Then walked home. I stopped at library and paid for the book Ott lost. Rob came for Hattie. Read in evening Wednesday April 15- 1931 Rob took me up town at ten oclock. I had a talk with Dr Ned Smith. Came home by Bus. I did not go to Childrens Hospital in the PM. Some rain. Letter form Mrs [Clute]. I wrote Ida before supper time Thursday April 16- 1931 I feel more comfortable today. Had a letter from Mrs Hammell at Boise. sent it to Nell Swisher and wrote Miss Owen at Boise. A fine rain last night. I slept in afternoon and read in evening The Whetstones busy with house cleaning fine weather.